After a lifetime of civil rights sit-ins, blockades at nuclear plants, and acts of anti-war resistance, David Hartsough remains a utopian believer in peace and justice. His latest campaign is perhaps the most quixotic of all. It dreams the impossible dream of a world that has abolished war. 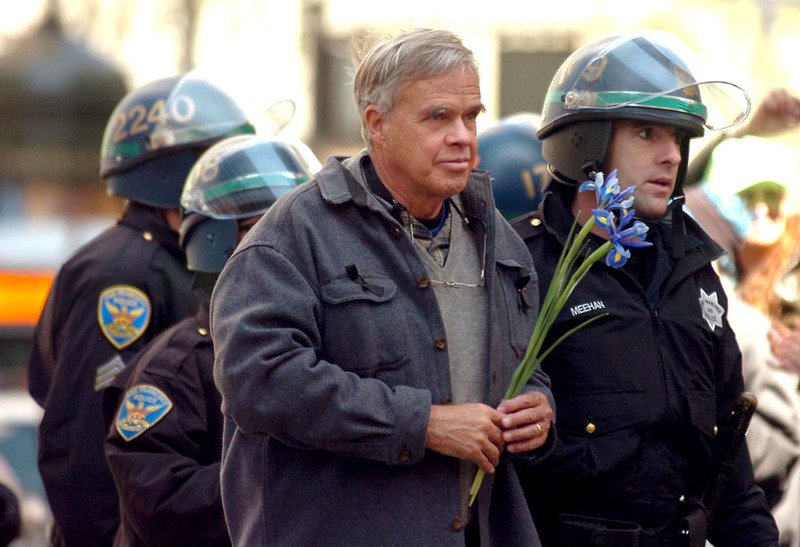 David Hartsough is arrested by police in San Francisco for blocking Market Street in an act of civil disobedience in resistance to the U.S. invasion of Iraq. During a long lifetime spent working for peace and social justice, David Hartsough has shown an uncanny instinct for being in the right place at the right time. One can almost trace the modern history of nonviolent movements in America by following the trail of his acts of resistance over the past 60 years. His life has been an unbroken series of sit-ins for civil rights, seagoing blockades of munitions ships sailing for Vietnam, land blockades of trains carrying bombs to El Salvador, arrests at the Diablo nuclear reactor and the Livermore nuclear weapons lab, Occupy movement marches, and international acts of peacemaking in Russia, Nicaragua, Kosovo, Iran and Palestine. It all began at the very dawn of the Freedom Movement when the teenaged Hartsough met Martin Luther King and Ralph David Abernathy at a church in Montgomery, Alabama, in 1956 as the ministers were organizing the bus boycott at the birth of the civil rights struggle. Next, while at Howard University, Hartsough was involved in some of the first sit-ins to integrate restaurants in Arlington, Virginia — white-hot confrontations that were violently attacked by white supremacists and the American Nazi Party. Just as Hartsough was present at Dr. King’s first campaign in Alabama, he also was arrested for taking part in the slain civil rights leader’s very last campaign, the Poor People’s Campaign in 1968. During the Vietnam War, Hartsough helped organize a seagoing Peace Blockade that gained international attention after activists in small boats sailed directly into the path of the USS Nitro. When seven sailors jumped overboard to join the peace flotilla’s resistance to the Vietnam War, it made headlines across the country. He was standing right next to his friend Brian Willson during a blockade of weapons shipments to Central America, when a munitions train ran over Willson, severing his legs and fracturing his skull. Two months later, in November 1987, Concord police broke Hartsough’s arm while violently removing him from those same tracks where he was blocking a train. Hartsough also was arrested in one of the most momentous anti-nuclear actions in our nation’s history, the blockade of the Diablo Canyon nuclear reactor. When the anti-nuclear power movement evolved into a movement against nuclear weapons, he was arrested repeatedly at Livermore Lab. During a massive uprising in Kosovo, he was arrested for conducting nonviolent trainings, and the jailing of U.S. activists created an international uproar. In all these campaigns and many more, he seemed to be guided as if by the hands of destiny to be present at some of the most epochal movements for social change. Perhaps the most striking case of serendipity occurred when Hartsough, at the age of 22, ended up in the Oval Office with a Quaker delegation that urged President John F. Kennedy to take immediate actions for disarmament and world peace. Hartsough also took the same message of peace to the Kremlin as the United States and Soviet Union stood on the very brink of nuclear war. Hartsough called himself “the token young guy” on a six-person Quaker delegation that met with President Kennedy to discuss world peace and nuclear disarmament at a time when the threat of nuclear war had reached an historic high point. The others invited to the Oval Office made up a who’s who of prominent Quaker peace advocates: Ed Snyder and Samuel Levering, executive secretary and chairperson, respectively, of the Friends Committee on National Legislation; Henry Cadbury, a professor at Harvard Divinity School and the chairperson of the American Friends Service Committee; Dorothy Hutchinson, president of the U.S. section of the Women’s International League for Peace and Freedom; and George Willoughby, who had sailed on the Golden Rule into the nuclear testing area in the Pacific. Penn, the founder of Pennsylvania, was a Quaker and a pacifist. Naming a nuclear submarine the William Penn is exactly the same as naming a battleship the USS Gandhi or a jet bomber the St. Francis of Assisi. Hartsough said, “Kennedy just grinned and told us, ‘I’ll see that it doesn’t happen.’ ” The president was as good as his word, and the nuclear-armed submarine was not named after the Quaker pacifist. The delegation said, “Yes, that’s exactly what we mean.” The Quaker team reminded the Catholic JFK that unconditional love and feeding the poor went to the heart of the New Testament. Then, they addressed the terribly urgent concern that had brought them to meet with the president as the world faced the very real possibility of nuclear war. They asked Kennedy to stop nuclear testing and to move the nation away from the growing threat of nuclear disaster. All six members of the Quaker delegation were highly impressed by Kennedy’s listening with an open mind to the radical antiwar values of the delegation, and his evident sincerity in understanding the urgent need to work for world peace. Kennedy only had 18 more months to live from the time of this meeting to his assassination in November 1963. In that short time, he stopped atmospheric nuclear weapons testing, de-escalated the Cuban missile crisis instead of pushing the button to unleash nuclear weapons on the Soviet Union, took important steps to stop the escalation of a nuclear confrontation in Berlin, and made the decision to bring U.S. advisers out of Vietnam. Hartsough said that Kennedy had run for president as a Cold Warrior, and his growing awareness of the need for peace and disarmament was a hopeful sign. True to his Quaker beliefs in speaking truth to power, the young David Hartsough spoke out for disarmament on both sides of the Cold War. While a student at Howard University, he studied for a year abroad in East and West Berlin. “At that time,” he said, “the United States and the Soviet Union were threatening to blow each other off the map and kill hundreds of millions of people in a nuclear war because we had so dehumanized ‘the other.’ They were no longer human beings. They were enemies. Again, a fateful sense of timing landed him in Berlin in 1961, the year that the Berlin Wall was built, a time of rising tension and perilous confrontation between the United States and the Soviet Union. His group spent about a month on a 6,000-mile trip through Russia and the Ukraine. They camped out and were invited into people’s homes for meals. One of their guides spoke fluent Russian, so they had in-depth conversations with people in their homes, churches and farming villages. Yet he was dismayed to find that the Russian people’s view of the United States was distorted with the same Cold War propaganda he had heard at home. Some questions that the Russian people asked about the United States really struck home. A month after his meeting with Kennedy, Hartsough was arrested for holding a prayer vigil in front of the White House calling for an end to nuclear weapons testing. His sign said, “Bomb Tests Kill People,” and he was jailed in Washington, D.C.
Then the Soviet police came and told them it was illegal to demonstrate against their “peaceful bombs” and they could get 20 years in prison. “We told the police we had been arrested a month ago in front of the White House for offering the same message,” Hartsough said. The police left, saying they had to talk with their superiors about what to do. They were not arrested, but Russian officials decided not to let Hartsough back in Russia for 26 years. “For 26 years, I was persona non grata — until Gorbachev,” he said. 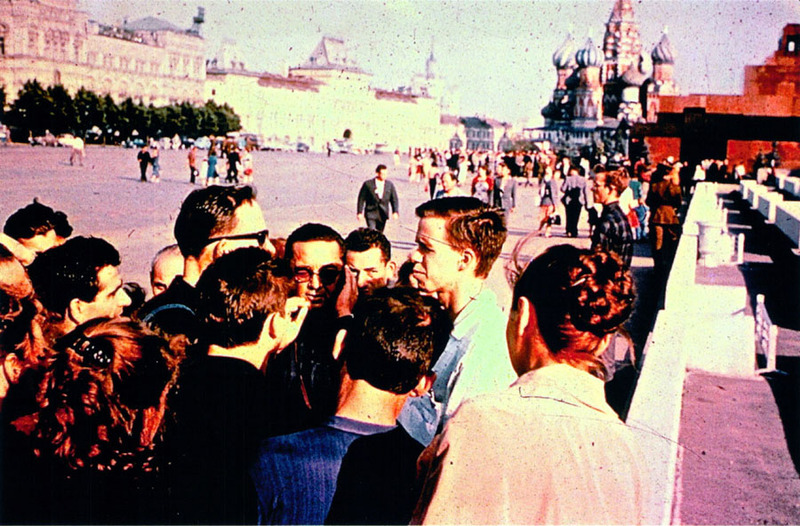 David Hartsough demonstrates in Moscow’s Red Square against Soviet nuclear weapons testing. Soviet police threatened him with 20 years in prison for the protest. Hartsough had just been arrested at the White House for protesting U.S. nuclear tests. The first time I met David Hartsough was in February 1982, right after many of us were arrested at Livermore Laboratory in the first major act of civil disobedience at the nuclear weapons facility. A photo on the front page of that day’s Livermore newspaper showed Hartsough being dragged away by the police in handcuffs. First impressions are interesting. The photo showed a man in a sports coat with short hair, glasses and a conservative appearance. Yet he had gone limp and refused to cooperate with the cop arresting him. Somehow, he looked like the quintessential Quaker, once again in handcuffs as Quaker dissenters so often were. David’s father, Ray Hartsough, was a congregational minister who had refused to become a chaplain or be involved in the U.S. military. Ray Hartsough went to Gaza with the AFSC and the United Nations in 1949, and spent nine months going through the battle lines and bringing food, medicine and tents to refugees. This made a deep impression on 8-year-old David. “He was willing to put his own life on the line for people he had never met,” he said of his father. Hartsough’s father became a Quaker and began working with the AFSC, and David got to know the “amazing people” his father brought to their home — civil rights activists Ralph David Abernathy and Bayard Rustin, and Quaker activists Steve Cary and Clarence Pickett. David also became a Quaker at age 13, and he has been a Quaker his entire adult life. His wife, Jan Hartsough, a dedicated activist on food and hunger issues, is also a Quaker. Both David and Jan are peace and justice activists who worked with the AFSC for nearly two decades. Quakers are a very tiny denomination in the United States — as tiny as leaven. Yet they have had a major impact on peace and justice movements, out of all proportion to their numbers. Quakers have been an integral part of the movement to abolish slavery, the Underground Railroad, the suffrage movement to win the right to vote for women, the civil rights movement, the anti-war movement, the Sanctuary movement, the anti-nuclear movement, and the prison reform movement. Quakers have been such a central part of so many campaigns for peace and justice, it is hard to believe that there are only an estimated 87,000 Quakers in the United States. By comparison, there are 75 million Catholics, 13.5 million Lutherans and 8 million Methodists in the U.S. I asked what being a lifelong Quaker has meant to him. He explained that Quakers try to speak out for justice and peace in the world, both as individuals and through the organizations they have created, including the Friends Committee for National Legislation (FCNL), the American Friends Service Committee (AFSC) and their denominational body, the Religious Society of Friends. It is a central article of faith to seek justice for homeless and hungry people, and for prisoners and refugees. And it is crucial to alleviate the suffering caused by warfare. “The causes of war are nationalism and greed and imperialism and we have a responsibility to address those causes of war,” Hartsough said. The metaphor that best explains for me the life path of David Hartsough is Johnny Appleseed. Like Johnny Appleseed, he has planted many seeds, and catalyzed many movements and social justice campaigns, and then he moves on over the next horizon to plant more seeds of peace. His uncanny ability to be at the right place at the right time is a source of amazement to me. As the director of AFSC’s Nonviolent Movement Building Program for nearly two decades, David worked to help form the Pledge of Resistance and Nuremberg Action Group to oppose U.S. military intervention in Central America. He did the nonviolence trainings to prepare Witness for Peace teams on peacemaking missions to Nicaragua, and then spent several months in Nicaragua with their volunteers. He helped form the Peace Navy that joined longshoremen in blocking the unloading of South African cargo ships in the anti-apartheid movement. He conducted nonviolence trainings for the Abalone Alliance, and he worked with Native Americans in the Four Corners area of the Southwest and at DQ University when it was threatened with closure. 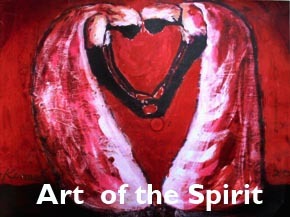 Another apple seed that Hartsough planted was the creation of AFSC’s Homeless Organizing Project, a program that organized many years of housing takeovers and civil disobedience in protest of society’s mistreatment of homeless people, and then began publishing Street Spirit in 1995. While attending seminary at the Graduate Theological Union in Berkeley, I did my field ministry with Hartsough’s Nonviolent Movement Building Program, rather than at a church, even though I am not a Quaker. My past 30 years of work on homeless issues — along with all of the housing takovers and arrests and the entire 20-year history of Street Spirit — is only one of the innumerable projects that Hartsough has catalyzed, just one of the many apple seeds he has planted along the way. Hartsough was only 14 when he organized his first nonviolent protest at a Nike missile plant. Now, 60 years later, he remains as actively involved as ever. Many people begin their lives as idealists or radicals, but as the years pass by, they become more moderate, more “reasonable,” often even more conservative. By contrast, David Hartsough remains, more than ever, the utopian believer in global peace and economic justice for all. His latest campaign is called A World Beyond War, and it is perhaps the most quixotic and utopian campaign of all. It dreams the impossible dream of a world that has abolished war. “Imagine all the people living life in peace,” as John Lennon sang. World Beyond War is just such a daring attempt to imagine a world at peace, and then organize for the creation of such a world. More than 4,000 people have signed its Declaration of Peace, pledging to work nonviolently to end all wars. “You may say I’m a dreamer, but I’m not the only one,” Lennon reminded us. He then spent two weeks in Vietnam as part of a Veterans for Peace delegation hosted by a group of American Vietnam veterans living in Vietnam. Hartsough had been arrested many times during the war for acts of resistance to the massacres, bombings and battlefield atrocities. He also was a full-time lobbyist hired by the Friends Committee on National Legislation to try to stop the Vietnam War in the 1960s. His work was to lobby Congress and interact with peace groups around the country. Hartsough and other Quakers had been arrested week after week for reading the names of the war dead to the U.S. Congress. When I asked what it felt like to finally travel to Vietnam for the first time after spending so many years of his life organizing to end the war, he called it a profoundly emotional homecoming. “In a way, it was just like coming home,” he said. Yet, he was coming home to a place he had never even visited before this year. He explained, “I had put in so many hours every day when I was a Quaker lobbyist trying to help members of Congress and the American people understand the reality of what that war was doing to the people of Vietnam. I was arrested and jailed a number of times for trying to prevent the bombs and weapons from being sent to Vietnam, and to stop the horrendous war the United States was inflicting on them. But I had never been there. It was hard to fathom the friendliness and humanity he found in a land ravaged by U.S. bombs and where the toxic after-effects of Agent Orange have created an epidemic of human suffering. It is a small miracle, this friendliness from the citizens of a country that the U.S. targeted with saturation bombing, napalm and anti-personnel weapons. The word “Friend” is synonymous with the word “Quaker.” It seems fitting that a Friend from North America would find friends in Vietnam — a country that he had always steadfastly refused to believe was an enemy. Sunday, November 9, 7 p.m.
Come meet author and activist David Hartsough. 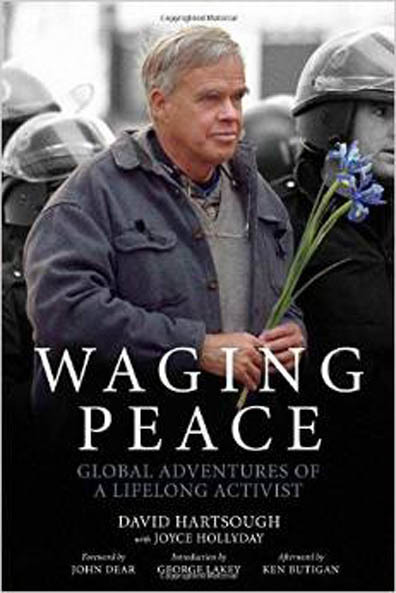 David will read from his new book Waging Peace: Global Adventures of a Lifelong Activist, and discuss his adventures in peacemaking.